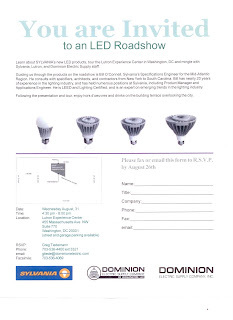 You Are Invited... to an LED Roadshow! 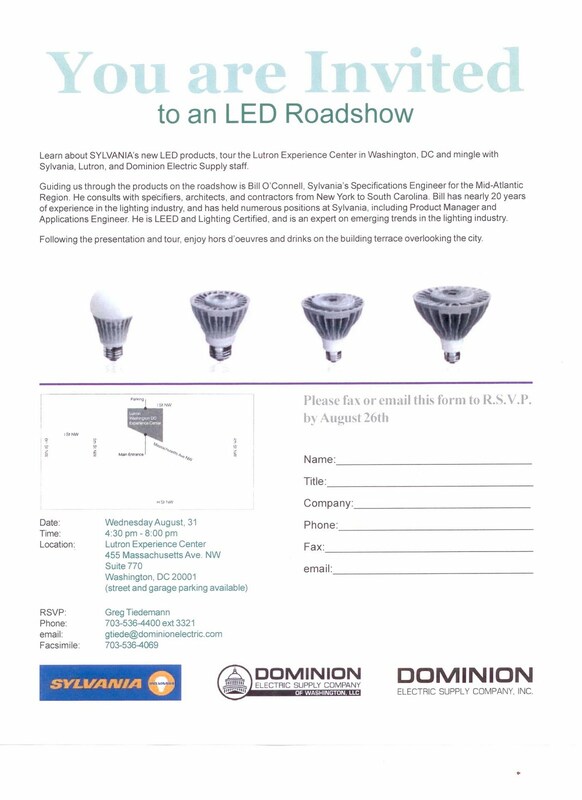 Learn about Sylvania's new LED products, tour the Lutron Experience Center in Washington, DC and mingle with Sylvania, Lutron, and Dominion Electric Supply staff. Guiding us through the products on the roadshow is Bill O'Connell, Sylvania's Specifications Engineer for the Mid-Atlantic Region. He conuslts with specifiers, architects, and contractors from New York to South Carolina. Bill has nearly 20 years of experience in the lighting industry, and has held numerous positions at Sylvania, including Product Manager and applications Engineer. He is LEED and Lighting Certified, and is an expert on emerging trends in the lighting industry. Following the presentation and tour, enjoy hors d'oeuvres and drinks on the building terrace overlooking the city. If you'd like to learn more about Sylvania, their web site is http://www.sylvania.com/ and if you'd like a preview of the Lutron Experience Center, you may visit them on the web at http://www.lutron.com/Experience-Light-Control/Inspiration/Pages/ExperienceCenter.aspx. My husband, Bob Schlawin, and I plan to attend this event, so we hope to see a lot of you there!